For the artichokes Rinse the artichokes and drain well. Pour the water into a deep glass container. Squeeze the juice from the two lemons and add both juice and peel to the water. Set aside. Take an artichoke and trim the stem, leaving about 1 inch. Snap off the leaves one by one until you get to the inner core, where the leaves change from green to a yellowish color. It will look like a flower bud. With a sharp knife, peel the stem and remove the remaining green leaves from the base. Cut the bulb in half crosswise. You’ll have two different halves: one with the stem, and the other without. Discard the latter. Take the other half (with the stem) and cut it lengthwise. You should have two pieces with half a stem each. With a spoon or knife, remove the fuzzy core of the artichoke. Also remove any pink-tipped leaves. Cut lengthwise again and soak the pieces in the lemon water. Take the other half of the artichoke heart and repeat the process. This way, you’ll have four pieces per artichoke. Repeat with the other two artichokes. Place the canola oil in a small, deep pot. Heat over high heat, making sure the oil doesn’t get too hot. If the oil begins to smoke, it’s too hot. Lower the temperature a bit. While the oil heats up, remove the artichokes from the water, one by one. Dry them with a kitchen towel. Carefully place the artichoke halves in the hot oil and fry for 15 minutes. You’ll notice that the oil bubbles, but doesn’t smoke. If it does smoke, lower the temperature a bit. Remove from oil and drain on paper towels. Repeat with the other artichoke halves. For the ancho chili aioli Crush the garlic and salt together into a paste. Add the mayonnaise, sour cream, lime juice, and ancho chili powder. Stir until everything is mixed well. Serve with the fried artichokes. To avoid getting pricked by the sharp artichoke leaves, trim the tips with kitchen shears before starting. Here’s a new way to eat artichokes: fried! For this snack, it’s ideal to use fresh artichokes. If you’ve never cleaned artichokes, don’t worry. Today, I’ll tell you how to do it. It’s easy but it requires a few steps. 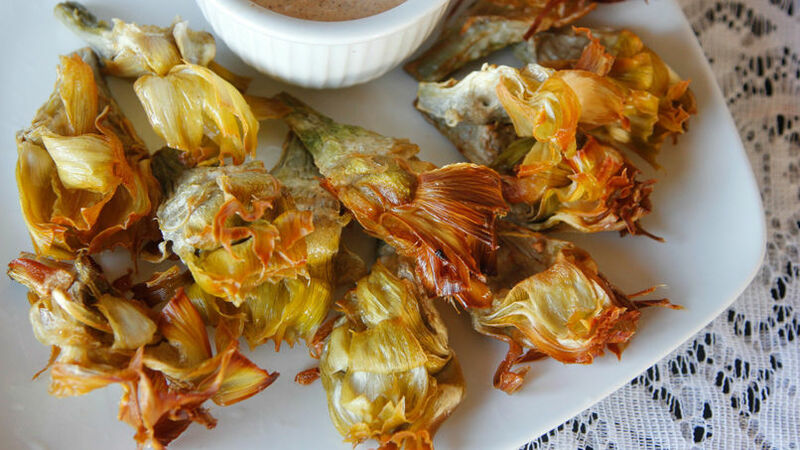 These fried artichokes go really well with aioli, which, for this recipe, has powdered ancho chili. It’ll be a huge hit at your next party!